27" x 39" mat, 1" squares on each side. 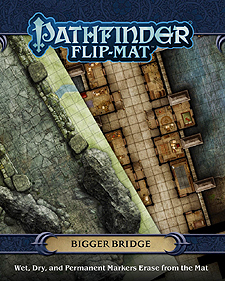 Whether players are traversing a giant's byway on a high mountain pass or braving the bustle of a cosmopolitan span, the possibilities for adventure are endless with Pathfinder Flip-Mat Bigger Bridge. With an area that's 45% larger than normal Pathfinder Flip-Mats at their disposal, Game Masters can now dream even bigger! This massive gaming accessory presents a wide causeway over a perilous mountain drop and a city bridge complete with shops and workshops teetering on its edges. Don't waste your time drawing every pylon, tower, and crenellation. With Pathfinder Flip-Mat Bigger Bridge, you'll be ready next time your players want to explore the wilderness or the city!